You can do this via the secure website GiveNow.com.au, who are supported by Westpac Bank. GiveNow.com.au is Australia’s most user-friendly giving portal and part of the Our Community network. It supports more than 3,500 causes across Australia. Click in the GiveNow logo to look at the GiveNow website. All online donation issue a tax deductible receipt. Please make your tax deductible donating (direct deposit, cash, cheque or money order) directly to us. Cheques and money orders should be made payable to 'Ithaca - Caloundra City Life Saving Club Inc' and whilst they may be posted to us, we prefer that that be given to an officer of the club (for safety). Cash can be given to any of our Club Officers (at the Clubhouse on the weekend), who will issue a tax deductible receipt. If you wish to speak to us about a donation, please contact the clubs treasurer. 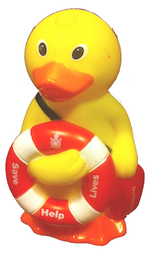 Please consider supporting us by hosting a Life Saving Donation Duck at your business or workplace. These stylised money boxes are small and suitable for a front counter of a work place and show your business supports a charitable community service. We can arrange for a collector to empty the duck on a regular basis, or by agreement funds can be deposited directly to our account. If you wish to speak to us about a sponsorship, please contact the clubs treasurer. We are a registered charity and endorsed as a Deductible Gift Recipient (DGR) by the ATO which means your donation is tax deductible, please click here to check our status on the Australian Business Register.